Thanks for visiting Monkton Guitars. We have been selling vintage guitars, amps and effects for 29 years. We carry Fender®, Gibson®, Paul Reed Smith® (Pre 1991) and other fine vintage gear. 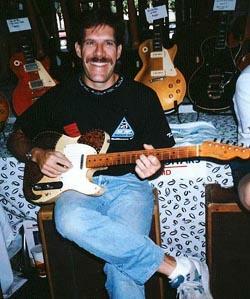 I started in 1989 with my best friend Bruce after visiting the Atlanta Guitar Show. The name came from my home town in Monkton, Maryland. We are located in beautiful Boulder, Colorado and operate primarily as a Web based business. If you are in the Boulder area we do offer the opportunity to see any of the available gear by appointment only. All purchased instruments are carefully packed and shipped via FedEx or USPS. We ship domestically and internationally. Shipping costs will be quoted upon request.